Walfrid Kujala joined the Chicago Symphony under Fritz Reiner in 1954 as assistant principal flute, and in 1958 became principal piccolo. 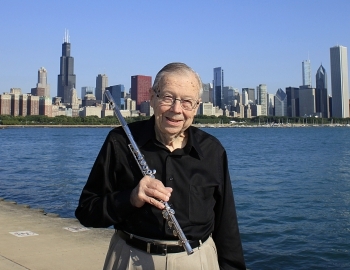 He was also principal flute of the Grant Park Symphony from 1955 to 1960. He had previously been a member of the Rochester Philharmonic from 1948 to 1954, and taught at the Eastman School of Music where he had received his BM and MM degrees and studied flute with Joseph Mariano. He has been a soloist with the Chicago Symphony under Sir Georg Solti, Fritz Reiner, Antonio Janigro and Seiji Ozawa, and has also appeared as soloist at the Stratford and Victoria Festivals in Canada. As a birthday present, his students and colleagues commissioned a flute concerto for him from Gunther Schuller in 1985, and the premiere was given by Mr. Kujala and the Chicago Symphony, conducted by Sir Georg Solti, in October, 1988. He has also performed the same concerto with the Spokane Symphony under the composer's direction at and with the Rochester Philharmonic conducted by Robert Spano. In 1990 he gave the American premiere of the flute concerto by Finnish composer Einojuhani Rautavaara at the National Flute Association convention in Minneapolis. Mr. Kujala is a past president of the NFA and was a recipient of its Lifetime Achievement Award in 1997. He is a contributing editor for Flute Talk. He retired from the Chicago Symphony in 2001, but still continues to teach at Northwestern University. For more information on Mr. Kujala and his publications, please visit www.walfridkujala.com.